Ensuring that the Paris Agreement on climate change is implemented and that countries meet their commitments is in the national interest of all countries around the world. After all, we owe our children and grandchildren the prospect of a safe place to live that is free from the damages of climate change. This agreement benefits Americans. It is in our interest to stay in the agreement and ensure that all countries live up to their commitments. The United States’ National Climate Assessment documents the dramatic changes already occurring in the U.S. as a result of climate change. Residents of some coastal cities have seen streets flood more regularly during storms and high tides. So have communities near large rivers, especially in the Midwest and Northeast. This has led to higher insurance rates as our communities become more vulnerable to climate-fueled disasters. Hotter and drier weather mean more intense wildfires that burn more acres closer to more people’s homes. Erosion could cause more communities to relocate. The historic commitments secured from all countries by the Paris Agreement are essential for reducing these and many other risks to the U.S. prosperity. The Paris Agreement significantly lowered global projected temperature rise from 7° Fahrenheit to 5° Fahrenheit (3.9° Celsius to 2.8°Celsius). Less climate devastation will occur thanks to this agreement. While more action is needed, this agreement can further limit disastrous climate damage thanks to the climate commitments it secured. No nation can deal with the effects of climate change alone. The Paris Agreement secured commitments from nearly every nation on earth to address climate change. It is a truly global endeavor. Countries put forward their climate commitments—ensuring that all nations are doing their part to reduce emissions and adapt to climate change. The commitments cover emissions from 190 countries—97 percent of global greenhouse emissions. The agreement secures, for the first time, commitments from all key emitters—including China, India, Mexico, Europe, Japan, and the US—to reduce their emissions. And since our action helps to spur others to act, we can’t protect Americans from the damages of climate change unless we act at home and help secure action from other countries. A large majority of Americans want the United States to participate in the Paris Agreement. Americans understand that global action protects us and that American leadership is critical for securing global action. Walking away would mean shooting ourselves in the foot. The Paris Agreement provides the framework for transparency and clear evidence of what is happening across the globe. The Paris Agreement’s reporting and review mechanisms provide assurances that other nations are doing their part, through comprehensive guidelines to hold countries such as China, India, and Mexico accountable for their commitments. The Paris Agreement includes an "enhanced transparency framework" that uses a common set of rules for both developed and developing countries (see here). These systems strengthen the international system by: (a) requiring that countries regularly report national emissions inventories at least every two years; (b) requiring that at least every two years countries report "information necessary to track progress made in implementing and achieving" its emissions reduction target; (c) subjecting these national reports to a "technical expert review" by a set of independent reviewers; and (d) conducting a public session where countries consider the progress countries are making towards their targets. A powerful domestic motivation for countries to follow through on their new commitments as a part of the Paris agreement is built on the nature of these commitments—these targets are based upon delivering actions that are in their own self-interest. 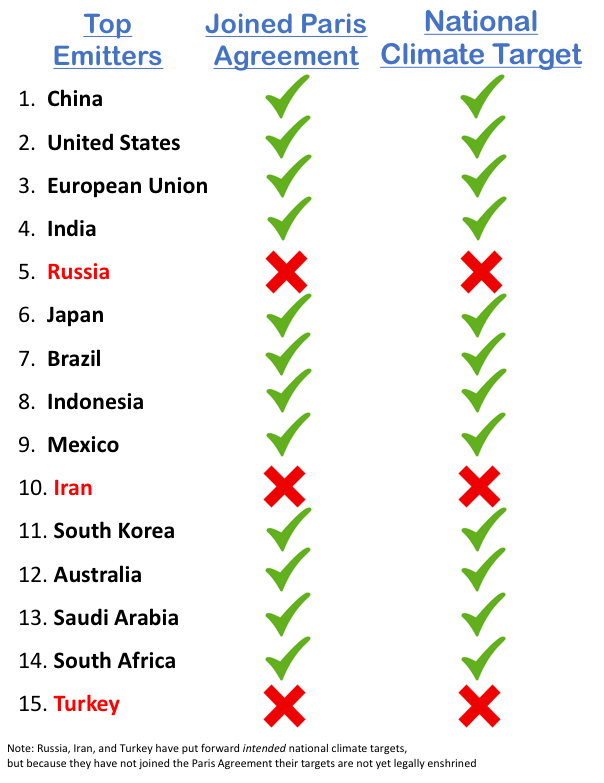 Politicians in these countries will need to follow through on their commitments as their citizens are demanding the actions necessary to meet the Paris Agreement since those measures meet pressing domestic needs such as air pollution, job creation, poverty alleviation, and reduced climate impacts. For example, China will continue to reduce its greenhouse gas emissions as part of its strategic plan to reduce air pollution and coal consumption. And India will continue to move forward with its massive renewable energy deployment to address energy poverty, and because renewable energy is the most cost-effective option. We can’t ensure progress is being made towards commitments of major countries if the U.S. is sitting on the sidelines and not showing leadership. The goal of the Paris Agreement is the same as that of the majority of Americans. The Paris Agreement is the first international climate agreement to include commitments from developed and developing nations to tackle climate change. That is why the Chicago Council on Global Affairs found that 71 percent of Americans surveyed (57 percent of Republicans and 87 percent of Democrats) said that the US should continue participating in the Paris agreement. The Paris Agreement calls for low emissions development and a shift to clean energy. Meeting the U.S. target as a part of this agreement will mean continuing the trend towards more wind, solar, and energy efficiency—in line with the majority of Americans who support renewable portfolio standards and clean energy use, according to a 2016 post-election poll for the Conservative Energy Network. This is consistent with other polls about the need to transition toward a cleaner, more energy-efficient economy and the economic, security, and health benefits provided by clean energy. The Paris Agreement has spurred momentum and investments in clean energy, a rapidly growing area for American jobs and businesses. Environmental Entrepreneurs’ analysis of clean energy and clean transportation jobs across America found that there are more than 2.5 million Americans working in clean energy in all 50 states. This includes 1.9 million jobs in energy efficiency and nearly 414,000 people in renewable energy generation, (about 300,000 in solar energy and 77,000 in wind energy), and about 170,000 in advanced hybrid and electric vehicles. This includes nearly 570,000 workers in the Midwest, over 85,000 workers in New York, and 66,000 workers in Pennsylvania, as just a few examples. America’s innovation and leadership in clean technology can benefit from the Paris Agreement. The International Energy Agency projects that the global clean energy market will total over $60 trillion in the next two-and-a-half decades, as countries tackle climate change. As more countries commit to low carbon development, the more opportunities there will be for America’s clean energy exports. Not taking advantage of the market for clean energy means companies and workers in other countries will dominate the market for clean energy resources and technology for the foreseeable future. China already plans to build a nationwide charging network for five million electric cars and has signaled that it will spend $360 billion on renewable energy by 2020 which will create over 13 million jobs. Businesses know that pulling out of the Paris Agreement would hurt the US economy while opening up the country to greater risks from severe climate impacts. That’s why over 600 businesses and investors such as DuPont, Gap, General Mills, Hewlett Packard, NIKE, Mars, PG&E, and hundreds of small business issued a statement to the new administration urging it to implement the Paris Agreement. American companies also know that failure to act on climate change implies huge financial risks as the damages take a greater toll. Some of the largest insurance companies in the world such as Liberty Mutual and USAA are already warning that not addressing climate change “needlessly exposes Americans to greater risks to life and property and results in much higher costs to the federal government.” The head of the Reinsurance Association of America has said that addressing climate change is sound public policy. The Paris Agreement creates opportunities for U.S. companies and workers to tap into growing markets for innovative technologies and services—areas in which America can excel. The Paris Agreement has increased ambition among cities and states across the globe to accelerate climate action. This includes city- and state-level commitments that will help us realize national commitments even faster. These are cities that recognize that climate action means more than just, clean, renewable energy. It also means more livable, healthier, and resilient cities. Dozens of American mayors—spread throughout the U.S.—sent an open letter calling on the President to continue being an active participant in the Paris Agreement. These local elected officials know that their constituents want more action on climate and that global action is needed. The 90 cities at the Global Mayor’s Climate Summit in 2016 represented a quarter of the world’s GDP—and American cities stand to benefit from working with counterparts to carry forward the Paris Agreement. States and provinces around the world also benefit from the mechanisms of cooperation that the Paris Agreement has built. State, provincial and local governments in the Under2 Coalition, led by California, have secured commitments to reduce emissions 80 percent by 2050 across 165 different jurisdictions. These areas represent close to $26 trillion, or one-third of global GDP. As local leaders closest to the citizenry, these local elected officials understand that acting on climate change is in the interest of their constituents and local business. Staying in the Paris Agreement recognizes U.S. responsibilities as the largest economy in the world and biggest historical contributor to the greenhouse gas emissions driving climate change. The United States from 1990 to 2012 was responsible for 18 percent of global emissions, but with less than 5 percent of the global population. Through the Paris Agreement the U.S. has worked with other wealthy nations to ramp up climate finance for the most vulnerable countries already suffering the harshest impacts from climate change. Sticking with the Paris Agreement and ensuring that all countries deliver upon their commitments is in America’s national interest. It protects us from the ravages of climate change that can only be minimized with global action. It creates ways to ensure that other countries are delivering on their own commitments. It is good for American workers and companies as it creates business opportunities and reduces financial risks from climate change damages. It helps the most vulnerable people and reduces security threats from unfettered climate impacts. That is why the Paris Agreement has the strong support of the American people and why the U.S. should champion the Paris Agreement. Trump wants to withdraw the US from the Paris Agreement. That would be a disaster. Here is a running tally of the thousands of people and organizations that have spoken out in support of the Paris Agreement. Trump’s decision to pull the U.S. out of the historic Paris Agreement on climate change is an assault on our children’s future, American companies, and all the countries in the world. Withdrawing from the Paris Agreement directly contradicts America’s economic interests. That’s why over 1100 companies worth well over $3 trillion dollars in revenues have supported the Agreement.